Pub at the Streatham Hill end of Brixton. Note: According to Brixton Blog, the Elm Park Tavern has had a substantial refurbishment (including the addition of a kitchen) since we last visited, so some or all of the below may be out of date. Located in the residential streets between Brixton Hill and Tulse Hill, this pub doesn't have an obvious presence but is worth seeking out. Entry is into a reasonably-sized room with bare floorboards and walls painted in dark grey and dark blue. 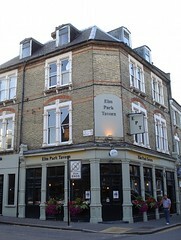 The pub sits on a corner, and has large windows looking out onto both streets of the frontage (with stained glass detailing above the door). Sofas and high-backed armchairs sit beneath these windows, and tall chairs line the bar. There are also a few normal chairs and tables; more of these in the back room (which has seating only, no bar service). Books are stacked neatly along the front windowsill, available to take away on a "give a book, take a book" basis, and a row of compact "smokin' umbrellas" hangs against one wall for people to borrow if they need a cigarette break in bad weather. There's usually a beer garden of some kind out the back, but on our September 2012 visit this was closed due to building work. Kake and Mark visited on a Wednesday evening in September 2012. The four handpumps offered three real ales: Purity Pure UBU (£3.40/pint), Purity Mad Goose, and Sambrook's Wandle. They also have a font for Stiegl lager, which Mark tried and pronounced to be good. There were about a dozen other customers in, most of them standing or sitting at the bar; the pub is of a size that makes this just the right number for a populated-but-not-crowded feel. The flatscreen in the front bar was switched on but the sound was off. Music was playing, a fairly eclectic mix ranging from All Saints to something PJ Harvey-ish, at a level appropriate for conversation. Service was friendly and helpful. They don't do any food, but they're happy for you to order in a takeaway; takeaway menus are displayed in a box by the door along with a sign inviting you to ask at the bar for plates and cutlery. Kake's verdict: I liked it here and would happily come back. Accessibility: A step to get in, and another step to the back room (where the toilets are). Last visited by Kake, September 2012. Opening hours taken from the 2013 Good Beer Guide. Last edited 2017-12-17 13:13:42 (version 5; diff). List all versions. Page last edited 2017-12-17 13:13:42 (version 5).